The Christmas Hills Raspberry Farm first planted their raspberries in 1984 and haven’t looked back since. The eight acres of succulent berries are ready to harvest at the end of November and the season can last as long as until the end of June. The on site restaurant also sells various condiments and jams as well as their more-ish dark chocolate covered raspberries. A small bag will set you back $5.80, but it’s worth it. 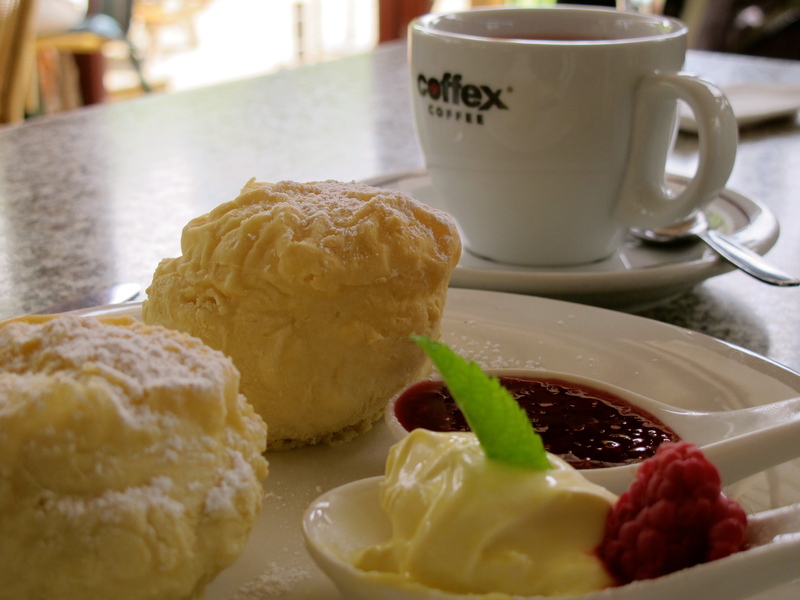 The scones are warm and light, served with amazing homemade raspberry jam and thick cream. There’s definitely not enough jam, I found you need at least twice as much, so don’t be afraid to ask for more. My travel companions order the gluten-free scones and are surprised that they are airy and light, and give them a five-out-of-five. You won’t be able to stop at the Devonshire Tea as the other desserts are just as good! Tea: A generous pot with loose-leaf teas. Try the raspberry/peppermint or raspberry/lemon teas. Overall: You’ll want to try every dessert on the menu. I’m not a whiskey drinker, but my partner doesn’t mind a drop and has become a kind of ‘collector’ of fine single malt whiskeys. Tasmania has also become internationally renowned for quality whiskeys, with some even topping the best 100 list. Located on the southern edges of Burnie, Hellyers Road Distillery is Tasmania’s most northern and produces about a dozen varieties plus a cream liqueur and a crisp vodka. The location is magic; an outlook over a lush green rolling landscape a distillery that doesn’t feel commercial. All activities radiate from the Visitor’s Centre. The Whiskey Walk Distillery Tour kicks off here, there’s the gift shop, and of course the whiskey tasting bar, as well as the Distillery Cafe. It’s still early and the lunchtime diners are yet to descend on the Distillery Cafe, but it’s perfect timing as the scones are straight out of the oven. Crispy on the outside with firm robust centres, it’s hard to fault these warm scones. The scones are paired well with rich and fruity raspberry jam and lots of thick whipped cream. My only grizzle is there isn’t enough jam. What am I going to do with all that cream? Tea: A basic variety of loose-leaf teas served in a good-sized teapot. Overall: Hypnotic sweeping views from every angle. Bass Strait is behaving, and there’s barely a ripple as the Spirit of Tasmania 1 sails across Bass Strait from Port Melbourne in Victoria to Devonport in Tasmania. On a day sailing, there’s no need to stow away in a cabin, as there’s so much to do. Stay on deck and wave Melbourne goodbye. In Port Phillip Bay, dozens of dolphins follow the ferry; dipping and diving, and with the occasional ‘Sea World’ high dive just to show off. Had enough sea air? Catch a movie at one of the two cinemas, listen to music in one of the bars, or explore the ferry, spending time wherever you choose. Whoever demanded that the crew announce meal times for TMK (Tasmanian Market Kitchen), Spirit 1’s main eatery, is a genius. How else would I know about the scones served at 4.00pm while cocooned in the lulling silence of The Lounge? Although The Terrace Lounge Bar serves pizzas and paninis, the casual self-serve eatery is the place for well-priced and appetising meals, and, of course, the scones. From a rather large tray of piping hot scones, choose your own, then add as much thickly whipped cream than you think you may need, and grab a handful of Kraft jam portions (remember, there’s not much in them). The scones are well-baked and oven-fresh but taste as though they may be made from a pre-made scone mix. I could be wrong, and I definitely don’t want to undermine the chefs, after all, it’s the middle of Bass Strait and where else can you get scones? Tea: A selection of Twinings tea bags served in paper cups. If arriving or departing by ferry, The Cherry Shed is a mere 10-minute drive from Devonport along the Bass Highway. The huge shed that The Cherry Shed Cafe and Gift Shop is located in looks a tad out of place surrounded by suburbia and busy intersections. Perhaps it was, once-upon-a-time, embedded in a field of green? The giant cherry out the front (think the Big Banana, Prawn and Pineapple on the mainland) acts as a lure for visitors making the rounds of Tasmania’s berry and cherry farms, so I’m not sure if the shed was in fact a work beast. As per the pic above I order the half serve; a full serve of two scones is also available. The scone is a good size, not ridiculously huge nor is a one-bite-wonder, and is crispy skinned and lightly sprinkled with icing sugar. A choice of either cherry or raspberry jam is teamed superbly with lots of chilled and thick slightly sweet cream. Naturally I go with the cherry jam, which is made from local cherries and supposedly made on the premises. It’s tart and rich with fruit, and does The Cherry Shed proud. Wander through the gift shop and stock up on ‘cherry’ related products, and send the kids to play in the giant cherry. Fresh cherries are available from mid-December to February. Tea: Basic choices in a range of tea bags, and some specialty loose-leaf varieties served in a small teapot with a bicky on the side. I have the green cherry tea, but it is a bit weak. Overall: A touristy diversion selling cherry infused goodies. The Two Oaks Tea Room sign grabs me as I hurtle along the Bass Highway, which is named after the waterway it hugs. However, when I arrive, I find it’s no tea room, but a cafe with a large extension that caters for events such as weddings and the like. The lack of tea room cosiness aside, the cafe does have a lovely garden and the Somerset Caravan Park that it fronts doesn’t interfere with the ambience. Bass Strait and the Australian mainland are on the other side of the highway, so not too far for a stroll to a beach. Choose from plain or date scones, which are served with rich raspberry jam and thick whipped cream that tastes more mock than fresh cream. I go with the plain scones. They are large and have certainly reached their microwavable limit erring on the chewy side. No doubt more raspberry jam would help mask this. Open Monday to Saturday from 10am to 4pm. Tea: A good range of T2 teas served in a teapot with an extra filled with hot water. Overall: A convenient stop on the Bass Highway. As a city, Launceston in northern Tasmania is mellow. So it’s no surprise that Glebe Gardens on the northeastern edge of the city centre follows suit. The garden centre and Glebe Cafe embodies that same chilled out vibe, and it doesn’t take long for a big city dweller like me to surrender to it. Sitting beneath the shady branches of what is a large cluster of well-established Tassie trees, I wonder whether they have been strategically planted or placed to create this ‘mini forest’. A wander through the ‘forest’ may only take 30 seconds or so, but the impact of it being there in this very manmade space is crazy. The cafe is a simple affair, serving up pre-prepared items such as sandwiches and pies, and of course scones. Fresh and delicate, it’s unfortunate the scones aren’t served up with the homemade jam that’s sold in the cafe. The commercial raspberry jam is much better than most, but with a little help from the thickly whipped cream, all can be forgotten. It’s a small garden centre but the gift shop is as big as those on the mainland! Tea: A basic range of loose-leaf teas served in a teapot. Overall: A basic cafe in a small mellow garden centre. Only a 15-minute walk from Launceston’s city centre, Cataract Gorge is a patch of bushland, cliffs, and a 36-metre deep natural swimming hole fed by the Esk River. There’s so much to do, it’s hard to know where to start! In summer swim in the free 50-metre swimming pool, hike upriver to the ruins of the power station at Duck Reach or take a ride on the world’s longest single span chairlift. Explore the Cliff Grounds, a beautiful landscaped Victorian garden containing ferns and exotic plants and more peacocks than you can poke a stick at. Don’t forget a stroll along the 1940s built suspension bridge. Once that’s done, take a break at the Gorge Kiosk, attached to the Gorge Restaurant. It’s very much a kiosk, and to me, there’s something unappealing about paying the same money for food that is served on plastic plates. A Devonshire Tea deserves better – teaware thank you very much! The tough scones served at room temperature aren’t particularly appealing; they simply don’t taste good, and are more dry than moist. There are a couple of Yarra Valley jam sachets (a raspberry and a strawberry), and a massive dollop of thick cream that tastes more like Nestle reduced cream from a can, as opposed to double thick dollop cream. Tea: A Twinings tea bag served in either a regular or large takeaway cup. Overall: Enjoy kiosk food alongside a plethora of wandering peacocks. A hundred years ago, the Majestic Theatre in central Launceston was once a buzzing entertainment hub with a Tea Room for refreshments. The former cinema still has a majestic and intact façade, but in 1970 the interior was transformed and in moved Neil Pitt’s Menswear. Not a newcomer to Launceston, the menswear store has been going since 1949 and moved into these digs in 1970. Neil Pitt’s Coffee Shop is perched on the mezzanine level, allowing a birds-eye view over the trousers. The store reminds me of David Jones in the 70s and 80s and it’s definitely something I haven’t seen for a while. What I love most about Neil Pitt’s is the fact that a cafe in an old-school menswear store is renowned for their Devonshire Teas, and most of all, men are ploughing through them. This is a revelation, and my partner is neither impressed nor amused. The cafe is integrated into the store and is very masculine with wood panelled walls depicting coates of arms of British towns. Scones are served at room temperature and although fresh and very CWA-like, a bit of heat in my scones may have bumped up the teapot score. The strawberry jam is average and the whipped cream is super light, looking as though it’s out of a whipping cream canister. Overall, this place is a classic, and a must for those interested in heritage and like to see proof that blokes do actually like to eat scones! Open 9am – 2pm, Monday to Friday. Tea: A small range of Twinning tea bags served in a classic large aluminium teapot. Overall: Only in Tassie are Devonshire Teas served in a menswear store. Stonesthrow Launceston is aptly named for its location on the edge of the city of the same name and just a stone throw from the CBD. The modern restaurant, which consists of more glass than any other building material, overlooks a pretty dam where paddleboats ply the waters and a cluster of caravans are parked in the overnight camping area. A petting farm is an attraction for the little people, while a few easy walking tracks meander through the property. There’s a 20-minute wait for scones, and the wait staff try to persuade me to choose something else from the dessert menu. Maybe 29 degrees is too hot for people in Launceston to eat scones? Steaming hot from the oven, the rustic scones err on the large side. I don’t know what it is, but they have a weird taste (maybe something added?) with the texture of dinner rolls. The small pot of tart and tasty raspberry jam is no match in size with the comparatively huge pot of Chantilly cream. Both are top quality and make the serving of scones something to be shared unless tackle it solo if ravenously hungry. Overall: Small city sophistication out on a semi rural farm. A few kilometres from downtown Launceston, Invermay’s cluster of museums is impressive. From the car park there’s a choice of the Tramway Museum where you can take a ride on a tram, the Planetarium, plus the Queen Victoria Museum. It’s at the back of the Queen Victoria Museum that you’ll find the aptly named The Railway Cafe. The cavernous space has a renovated train carriage that’s decked out with a row of booth style tables. There are quite a few seats just in front of the cafe kitchen, plus some outside (if the weather is good), but I choose the little renovated train carriage. It’s not a particularly atmospheric renovation and the acoustics are lousy. You’ll feel it especially if surrounded by a family or two. The scone arrives with a spread of fairly standard strawberry jam and a squirt of dairy whip cream. The whole thing looks lousy and I’m not enticed to eat it. Add to it a mug of tea that I could easily have at home, without the noise. It’s a shame the quality isn’t better as the museum has a good vibe. Tea: A selection of teabags served in either a small or large cup. Overall: A very ordinary spread but interesting museum. It’s truly amazing how versatile lavender is. Bridestowe Lavender Estate in Tassie’s northeast does amazing things with it. The Estate specialises in French lavender, or Lavandula angustifolia, as it’s suitable for both perfume and culinary use. Check out the on site distillery and watch how pure lavender oil is produced. Farm tours are available or otherwise just hang out. To get to the cafe you must enter (and exit) via the gift shop, so shopperholics beware! I’m not sure whether it’s my imagination, but the range of edibles like lavender infused jams, teas and chocolates to teaware, toys and scented lavender pouches for sprucing up stale smelling drawers and cupboards, seem to emit a lavender hue. Once finally at the café, there’s a choice to sit in the large dining area or out on the much smaller verandah. The cafe menu is obviously ‘lavender themed’ – we’d be disappointed if it wasn’t! The lavender scones are the perfect size and are robust rather than creamy and fluffy. Todays’ jam is rhubarb and lavender jelly, which is smooth in texture and not particularly sweet – the perfect accompaniment to the scones. The double thick creams tops of this lovely spread. Make sure to wander around the property, especially between December to February when the lavender is in bloom. Tea: A brilliant range of lavender infused loose-leaf teas served in a pot for one, two or three. The specialty touch is a nice touch and the teas are sold in the gift shop. Overall: Can get busy as it’s on the tourist trail, but lovely all the same. The House of Rhubarba sign is small and totally overshadowed by the old signage for the takeaway Fish ‘n’ Chips shop. To be honest, I don’t see the shop at all, for my eyes are focused on Cafe Rhubaba. Just in the entrance of the cafe are a selection of rhubarb products; jams, jellies, vinegar and vinaigrettes, chutney and relishes, products of the House of Rhubarba. The cafe has a country feel, which is Scottsdale to a tee, and with a seating area outside you can watch the locals go about their business. Shirley’s scones are fresh from the oven. The triple serve scones are small and crispy, sensationally fresh. The jelly jam is interesting – could it be rhubarb jelly? Or is it jam? I don’t ask, but it’s a lovely addition and pairs well with the whipped cream, which is super thick. Love the China tea cup. Tea: A small selection of teabags served in a teapot. Expensive at $5 a pot! Set amidst lush valleys in Tasmania’s north-east, the Holy Cow Cafe in Pyengana is tucked away up a country road not far from the Pub in the Paddock. The farm cafe uses ridgy didge dairy cows as the main attraction to draw in crowds of city slickers keen on a taste of the country. The gorgeous views are soul cleansing in itself, and the dairy cows are amusing to watch as they come in for milking and a well-earned head and back scratch. To keep with the dairy theme, a milkshake can be ordered instead of a tea or coffee as part of the Devonshire Tea. Since it’s something different, I go with a chocolate milkshake. It’s certainly a novelty, but I’m still not swayed, I’ll definitely stick to tea with my scones. The scones are fresh and crispy, but their substantial size does not match the quantity of the condiments. Although there’s enough of the Pyengana whipped cream, the fruit-rich raspberry jam is on the thin side and barely covers a scone. Am I the only one who likes a thick cover of jam on a scone? I’m impressed with the unique creamy flavour of the cream and it’s thick enough as well. Wander about the shop and take home some Pyengana cheese or other cow themed souvenirs. Tea: Choose from a handful of loose-leaf teas, coffee or a milkshake as part of the Devonshire Tea ensemble. Overall: A quirky diversion to a working dairy farm. Wander the streets of this National Trust classified Georgian village that dates back to 1811 for a taste of Tasmanian history. Not only is this a pretty village but also many of the historic buildings remain well intact. Businesses have settled in nicely to heritage buildings, restoring and reviving them, much like the Ingleside Bakery. Housed in the old Evandale Council Chambers that was built in 1867, the property is quite a sight. The towering walls and sky-high ceilings are a drawcard, as is the pretty flower filled courtyard. The licensed bakery/cafe took over the premises in 1988, and uses some of its space as an art gallery, and sells local Tasmanian gifts and produce, wines and whiskey. In winter the open fire is a welcome, but in warmer weather the courtyard is the winner. I almost have a mild panic attack when I don’t see any scones on the counter or in the cake cabinet, as I’ve had this place on my ‘to-visit’ list for some time. Never fear as they are on the menu and are offered as either a full or half serve. I have high expectations as the bakery is impressive, but my scone tastes more like a sweet dinner roll. Not even the dusting of icing sugar can mask the taste of an inferior scone. There’s just enough jam and cream for the one scone, and I wonder whether you get more with the full serve? The rich raspberry jam is superb and goes excellently with the double thick cream. Be sure to have a wander around the village to appreciate a couple of hundred years of history. Tea: A small range of Art of Tea loose-leaf tea served in a small pot. Overall: A gorgeous heritage building in a gorgeous heritage heavy town. Somewhere along the Tasman Highway in the countryside on the Launceston side of Springfield, is the Springfield Tea Room. As I drive up the driveway, I don’t realise it at first, initially thinking that the ladies in the tea room are in costume, but this is the real deal, a true blue working Amish farm. My partner is instantly uncomfortable and I have to coax him out of the car. The tea room is too warm today as there’s no ventilation and a skylight adds to the warmth, which I suspect are the perfect conditions for chilly Tasmanian days. Luckily there are a few tables of people, creating a more welcoming atmosphere, as I feel awkward with the subdued Amish waitress sitting in the corner with her calculator. The room is set up for sewing classes with reams of fabric and sewing bits ‘n’ bobs lining the walls. There is also homemade stone ground bread, cakes, and jams and jellies for sale. This DT is probably the bargain of the century; a measly $5 buys two scones, a grand choice of homemade jams, thickly whipped cream and a range of loose-leaf teas that tops most cafes I’ve been to. The scones are served at room temperature and although not light and fluffy, tastes fresh enough. It’s a hard choice; the jams and jellies are all too good. I decide to try something different and go for the crab apple jelly, which is light and subtle. Open Monday to Saturday. Tea: An extensive range of interesting loose-leaf teas served in a teapot. Second hand bookstores are becoming few and far between, so its surprising to find one in the back streets of St Helens. The easily seen ‘blue house’ known as St Helens Books is stacked floor to ceiling with shelves of pre-loved reading material for all genres; it’s amazing what you can find. When the weather warms there is picnic table style benches on the front lawn, otherwise cosy on up amongst the books. There’s a cluster of timber tables and chairs, and when I was there a table of gentlemen were playing cards. I am told scones are baked on Saturdays, and are snap frozen for the rest of the week. It doesn’t sound appealing, right? But this is where I am wrong – the large, creamy and slightly crispy scone is exquisite! The scone is heated up in the oven rather than microwaved, which makes all of the difference. The jam is fruit rich homemade raspberry jam – it doesn’t get better than this. To top it off the fresh cream is thickly whipped, and there are generous portions of both the jam and cream. Tea: A huge variety of different brand tea bags served in a teapot. Overall: Quiet and cosy, it’s the quintessential Tassie hidey-hole for when the weather is too bad to be outdoors, which for this mainlander, is often! Overall: Small city sophistication out on the semi rural farm. Tea: A good range of T2 loose-leaf teas served in a small teapot, plus a tiny pot of hot water on the side. Overall: Definitely the best cafe in town. Conveniently located on the Tasman Highway amidst the green rolling hills of Pyengana, Willows Roadhouse is a typical old school roadhouse servicing the needs for fuel and steak sandwiches. It’s a peculiar place to find a Devonshire Tea, but it’s well sign posted and I guess it draws in the crowds. Tasmania is after all Australia’s unofficial home of the Devonshire Tea, so why not offer them at a roadhouse alongside chips and Chiko Rolls? It’s too windy outside to comfortably take tea at one of the timber picnic tables on the front lawn, so instead we sit in the dining room, which also houses Tasmanian souvenirs including quirky Aussie road signs. The smell of cigarette smoke is strong, like it’s embedded in the carpet and lounges and reminds me of pubs before the no smoking laws came in. The menu reads like a 1980s outback diner, and nostalgia tragics will love it. The scones are surprisingly good – fresh and pretty, and far better than I expect. The spread is let down by the average strawberry jam and the synthetic cream from a can. With some healthy competition in the area, the Roadhouse may want to pick up their game but by all means keep the scones; it’s a quirky place to have them! Tea: A basic range of tea bags served in a mug. Overall: Homely old school roadhouse.